RETIRE IN STYLE BLOG: My Grandchild asked: Why didn't you tell me about etiquette? My Grandchild asked: Why didn't you tell me about etiquette? My twenty-something granddaughter told me at Christmastime she had asked her mom why she didn't know anything about etiquette. That was the when I began thinking about the subject. 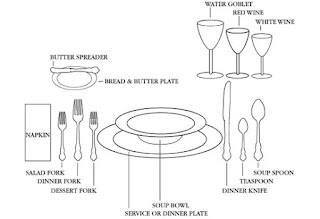 The dictionary defines etiquette as the conduct or procedure required by good breeding or prescribed by authority to be observed in social or official life. In this day and age good breeding is not a term we use at all but good upbringing might work in that case. In the case of manners I have always thought the manners were the behavior that resulted from the knowledge of etiquette. I am not sure the dictionary would agree. Oh well! I asked a group of my friends last night what they had been taught when they were young that would have passed as instructions in the art of etiquette in their daily life. I was surprised at what we all had in common. We were not raised in the same part of our country and some were from cities and other's from very small communities. Still it was all very much the same. at the outside and work your way in. Don't reach across the table. Say "please pass the_____"
Don't sing at the table. Dress up when you go to church. Do on put your left hand on the table. Keep it in your lap if you are not using it. Men open doors for ladies...that included car doors as well as entrances to a building. Chewing gum was not ladies like. We did not apply our lipstick, powder or comb our hair in public. But in this day and age things are a little different. I for one abandoned a lot of the social graces during the women's liberation era because I was perfectly capable of opening my own door, etc. I regret that now because it really was such a nice gentle act of kindness on the mans part. Maybe we can bring back some of our old habits and enjoy those small kindnesses again. What's Cooking in America had the best information on dining I have seen in a long time. I have printed this off so I can share it. 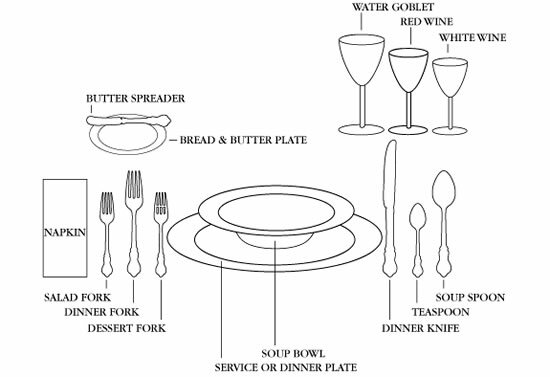 It is called United States Dining Etiquette Guide. You should also check out 8 Basic Etiquette Rules. I think you will surprised at how many of those old rules of etiquette I listed are still valid. It was fun for me to compare the old and the new. In today's society a small return to social graces is a welcome change. If the young people ask, we know they are concerned. Give it some thought and even share what you consider to be important. For example, maybe you are wondering about the thank you note. Do you have an opinion? What do you think about electronic devices at family gathers? What about cell phone etiquette? Let me know. Your shoes should be moderate and you should avoid extreme hairstyles or colors. Also, keep makeup and perfume to a minimum. No jeans or shorts, no tank tops, crop tops, or anything especially low cut (shirt or pants) or too short (skirt or blouse) - keeping everything professional is a must. 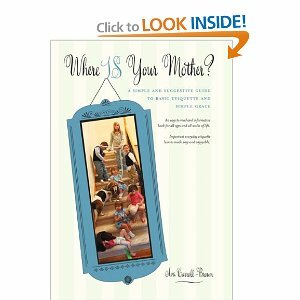 Amazon has a book listed called Where IS Your Mother? : A Simple and Suggestive Guide to Basic Etiquette and Simple Grace . I am going to order it. It just seems that I need to brush up on my manners sometimes. Cheers to manners. Good reminder. Fun thoughts. Some I practice and some I do not. I taught everyone how to shake hands properly in home ec. I was shocked that many young men and women did not know how to introduce themselves! Left hand in your lap pretty much went out with slapping a left handed child for writing with their left hand. The Europeans use their left hand constantly at the table. I was brought up in the "come as you are - God loves everyone" Church. I am the worst about dressing for Church. The rest of the list is pretty much how we run our household.